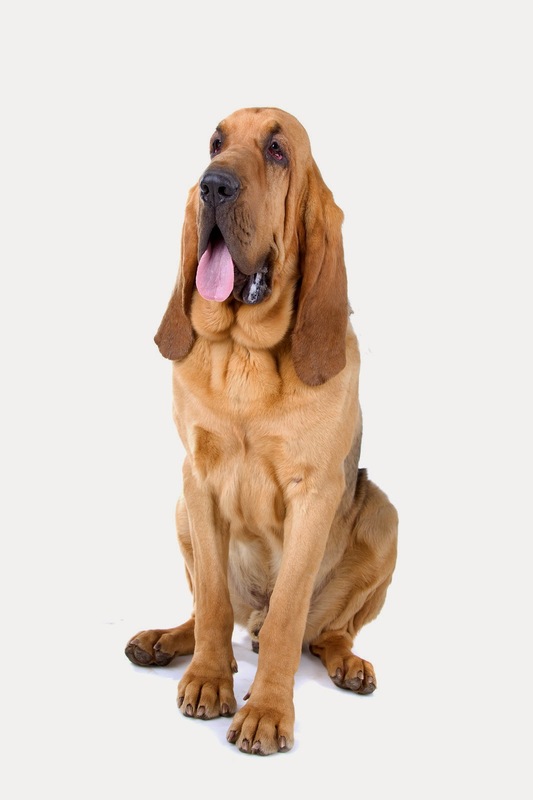 The Bloodhound is an old breed, and depending on who you ask it might come from France, Belgium, England, or Scotland. We don’t know exactly how old the breed is, but it is mentioned in writings from the third century AD as a dog unrivaled for scenting power and determination. The ancestors to the Bloodhound are believed to stem from the Mediterranean countries, and came to western Europe from Constantinople. At the time there were two strains; black or white. The black dogs were known as the Chien de Saint-Hubert and were bred by monks at the Saint-Hubert Monestary in Belgium. The white dogs became known as Southern Hounds. The breed reached its modern form in England. Bllodhounds are tireless workers for law enforcement, and they are so good at tracking a scent their work has been accepted in courts of law. They can detect a scent trail left several days ago, and the average bloodhound has around four billion olfactory receptor cells. The average human has around five million. These dogs are affectionate but often shy and sensitive. They enjoy company, both from other dogs and humans, and they’re known for being easygoing. They require regular brushing, and all the wrinkles must be kept clean. A Bloodhound can weigh up to 110 pounds, and will require a large or extra large PlexiDor dog door depending on the individual. Some of our picks even offer Wi-Fi capabilities and programming functionality for dispensing food at predetermined times. When users buy our independently chosen editorial picks, we may earn commissions to support our work. Skip to the best automatic pet feeder reviews on Amazon.